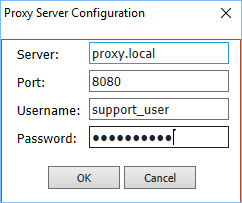 The Proxy Configuration dialog allows you to enter HTTP proxy details for Keyman Desktop Configuration. Most users do not need to change their proxy configuration. Proxy configuration is used only in networked environments, and if a proxy server is present, your network administrator will be able to provide you with the details required. Proxy details are used when checking for updates online and when downloading a keyboard layout. If no proxy details are entered, Keyman Desktop Configuration will use the proxy settings from Internet Explorer.